As I write this I have just a few days left as Perinatal Service Manager for Berkshire before I retire. I joined Berkshire Healthcare in 1992 and was interested in perinatal mental health straight away. My own baby was just a few months old and he is now 26. I’d always wanted a service that reached across the county and it was that vision that has really kept my focus over the past 26 years. We were able to secure bit of funding prior to the Community Service Development Fund (CSDF) but being successful in Wave 1 of the CSDF has meant we’ve been able to develop the specialist services right across the county. I’d had 26 years to think about what a service might look like and how we might implement it. Recruitment was a concern but we were able to recruit some experienced clinicians and support some passionate clinicians who had limited perinatal experience. This formed the basis of the team in place now and we have gone from three people to a team of 18. Recruitment is a challenge now as more specialist perinatal teams are recruiting but this also means there are more experienced practitioners around. As we’d started a limited service prior to the CSDF funding we already had some processes in place but over the past year we’ve moved from a couple of desks to an office space with 10 desks. The data system we collect has been modified to ensure we are able to collect and demonstrate the work we are doing, capturing referrals and referral sources, interventions and outcomes. A wonderful admin team supports perinatal clinicians, CBT therapists, psychiatrist, nursery nurses and a perinatal pharmacist who provide a single point of access for referrals from all sources. We have a lived experience group that has increased in number and I worked closely with one of our ladies with lived experience to co-produce the Wave 1 application. This group has continued to be involved in all aspects of our development and has supported us at local, regional and national training events by telling their stories, taking part at our interviews (and asking really challenging questions), and by supporting our peer support site ‘Support Hope and Recovery Online Network’ (SHaRON). SHaRON is our invitation only, clinical and peer moderated social media site that is available to women right across the whole pathway. It is ‘owned’ and administrated by the perinatal team and five of the women who have used the site now hold voluntary contracts with the Trust and support the clinical team by providing peer moderation on the site. The users of this site really appreciate the support, the humour and that they can be themselves without judgement of any kind. One of the other areas funded by the CSDF is the trauma pathway which is running as a pilot but has already demonstrated the need is there. This provides quicker access to support for women who have experienced birth trauma, including group and individual therapy, and the outcomes for the women are positive. We have been able to provide care and support to more women than we had anticipated. Our perinatal pharmacist has been influential in the service our women receive and contributes to maternity planning for women considered at high risk, or those requiring pre-conceptual counselling and our nursery nurses contribute to the provision of a whole service to our mums. When I first started collecting data in 2012 just 357 clients were identified as perinatal clients. In the first three quarters of this financial year, 638 were referred, mostly from midwives, who have undergone specialist training to help them identify issues early, GPs and health visitors. As I leave the service I’m so proud of what we’ve achieved and more than anything that the feedback we get from our mums is so positive. I am privileged to be ending my career completing the vision that I had some 26 years ago. It never ceases to amaze me that the people who work in perinatal are consistently kind, caring and driven to improving the service for the women and families they see. I am also humbled by the women who have used our service who are willing to stand up and tell their stories to ensure the right services are developed, helping to reduce stigma so that women feel able to say how they feel to professionals who have a service they can refer to. As I look forward into retirement I know I can’t walk away altogether so I will be returning one day a week to continue the work I have been doing over the past four years as perinatal lead in the Thames Valley SCN/Joint chair of the Regional Perinatal MH Network and one day a week working to expand SHaRON into other services. 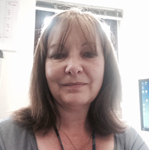 Bryony has worked as a mental health nurse and manager in the NHS since 1984 and worked with an interest in perinatal mental health since 1992. An RMN by background she has worked as a ward sister with responsibility for a small (now closed) MBU, a CPN in the community and for the past 6 years as perinatal service (and development) manager developing services for Berkshire. For the past four years alongside developing services in Berkshire she has a perinatal lead role in Thames Valley and for the past 2 ½ years has also chaired the Thames Valley Regional Perinatal Mental Health Network. Bryony retired from her service manager role at the end of March 2018 but will be continuing working part-time delivering SHaRON into new services and continuing as a Perinatal Lead in the Thames Valley. Congratulations Bryony on your retirement and immense contribution to PMH in Berkshire!